In my book Its Me Or the Coupons, I show you how to set up a system for using coupons without it consuming your week. Couponing is a powerful way to save money. But it involves shopping every week. Recently I decided to go back to doing my meal planning and grocery shopping on a monthly basis. You can read all about the benefits and reasons for monthly meal planning here. At first glance it seems like shopping on a monthly basis would keep me from using coupons and buying items when they’re on sale. Not so. You just have to merge the two strategies and you’ve got double savings! Once you’ve made a monthly menu, go ahead and make a list of everything you’ll need to make those meals. Only include produce for the meals in the first week or two. This will be your “big trip”, the one you do once per month. For the sales and coupons, and your produce for the last two weeks, you’ll still make a trip to the store but it will be a very fast, very focused trip. Make your list once a week of just the items that are on sale at their lowest price and for which you have a coupon. Be careful here. The temptation is to buy anything on sale and anything you have a coupon for. Be strict about this. Only the best deals and only if you would have brought it home anyway. Junk is still junk even when it’s free. Your list will be short, compared to a regular weekly list. You can quickly run in and out and only buy the deals. I find I can do this very quickly, without ending up with “extras” in my cart, if I truly only have deals on my list and don’t start filling the list with other things. Once you’ve slowed down to get one extra you’ve broken your stride and you’ll start filling your cart. Sometimes what I do is make my list of deals and have my husband stop on his way home from work. He doesn’t mind because it will be a short list and he knows that by doing it this way, we are saving time and money. Because you are shopping for sales each week and building your stock pile, you will not need all of the items on your monthly grocery list the day you do your shopping. I keep a master grocery list for each month of menus. I use a different monthly meal plan for each season. Each month I just look at the master list and cross out what I already have in the pantry. This is the best of both worlds. I’m buying items at their lowest price, but only planning and really shopping once a month. 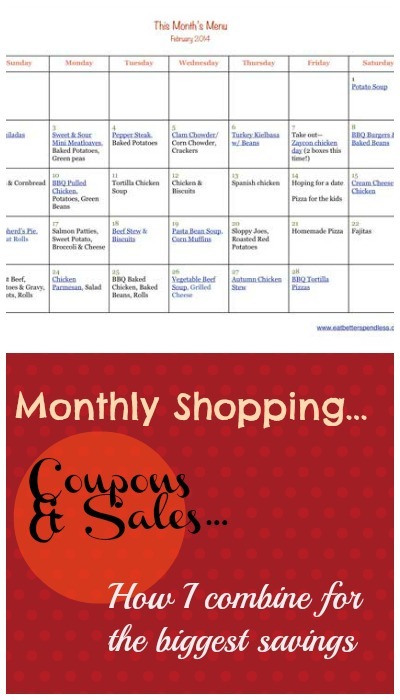 So, whether you are using coupons or not, consider making a monthly shopping list. You’ll appreciate the time and money you save! This article was adapted from the book It’s Me or the Coupons. For more information, click here.